This necklace is a simple and very effective way of highlighting an art glass bead and developed out of a need to showcase focal beads without overpowering them. I also wanted a design that meant the feature bead was removable so you could build up a wardrobe of interchangeable ribbons and bead pendants. Based on a previous necklace I had made, this particular necklace was originally beaded for the article ‘Using focal beads’ which appeared in the March 2004 issues of the Beadworkers Guild journal. 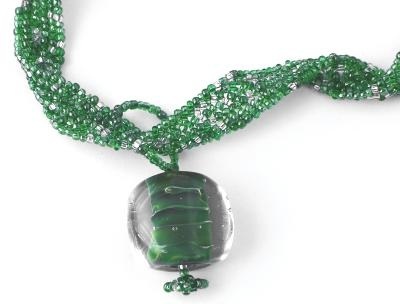 In August 2004 it won first place in the Focal Bead Challenge run by The Glass Beadmakers UK. The original prize-winning necklace has now been sold. The instructions to make this necklace are available, details can be found here.